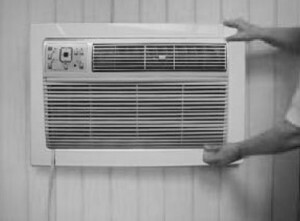 Heat pumps are a great way to heat or cool a home with only electricity. No gas is required for a heat pump to work. Heat pumps work the same way a regular air conditioner works only reversing itself in the winter to heat a home instead of cool. The Frigidaire FFRH0822R1 BTU unit runs from 115-volt outlet and can output 8,000 BTU of cooling and 7,000 BTU of heating. Like most all packaged units it comes charged with refrigerant ready to run. It runs surprisingly quiet for a package unit but does make some noise. The Frigidaire FFRH0822R1 is a good unit that makes installing a heat pump easy and quick. This unit from Amana is another nice heat pump that comes ready to run and slide into a wall. It is a 230 volt unit so be sure to have the correct power 230 volt power outlet for it to work. Currently there are only a few heat pump through-the-wall units. With that said there are a few with those above to be the best units we have found. There are units that have supplemental heating which come with big heat strips like a space heater. Supplemental units are not the same as heat pumps and use more electricity to heat a space. Heat pumps work on the same principles as air conditioners only reversing during the winter to put out heat and are very efficient. Every heat pump does have a low temperature it can work at in the winter and still pull heat from the air. Most newer models easily work efficiently down to 20 degrees or less. If the temperature drops below its rated working temperature it will still work but once the outside coils freeze they will go into air conditioning mode for a short while to melt the ice off that can build up on the outside coils. Through the wall heat pumps are popular since they are easy to install compared to standard large home unit or a mini split system. Through the wall heat pumps come packaged with all the components located inside the packaged unit. They simply need the correct size hole cut into a wall so the outside coil can expel heat or cold when desired. This still requires some construction knowledge and care needs to be taken not to cut into electrical lines or pipes that may run through a wall. It is much easier if an existing unit is being replaced by simply getting the correct sized dimensions of the old unit and transferring them to the new unit. One last thing to keep in mind is the electrical where the unit plans to be installed. 220 volt units work more efficiently than 120 volt units but most outlets are not wired for 220, usually only a clothes drier or electric water heater have 220 volt outlets. Be sure what voltage is located where the unit is to be placed. Having a 220 volt line installed can be done but will only add to the cost. 220 volt units do run more efficiently and are usually lower cost units to run which is why most heat pumps are 220/230 Volt units. Everyone will have a different experience and requirements for their home, from cost to size, so be sure to read the reviews on Amazon, forums, or elsewhere to be sure a unit is a good fit for you. Does anyone make a 5000 btu through the wall heat pump with supplemental heating? I WOULD LIKE TO REPLACE MY CARRIER XQ SERIES THROUGH THE WALL HEAT PUMP. IT IS 10 YRS OLD AND QUITE NOISY, BUT STILL PERFORMS QUITE WELL. CARRIER NO LONGER PRODUCES HEAT PUMPS, SO I AM LOOKING FOR A UNIT THAT WILL FIT MY EXISTING UNITS DIMENSIONS ( 25 3/16 X 23 3/4 X 16 3/4 ) OR MY CASING OPENING DIMENSIONS (26 3/16 X 17 7/8]. ANOTHER APPROACH WOULD BE A SLIDE-IN CHASSIS THAT WOULD FIT INTO MY EXISTING CASING. ANY THOUGHTS OR RECOMMENDATIONS?